How do I view conversions in my Outbrain Dashboard? If you have implemented Outbrain’s Pixel on your site or via Google Tag Manager and have received at least one conversion, you’ll be able to see your results upon logging in to your Outbrain account in the Campaigns view. Conversions come in a few shapes and sizes, so make sure that you have properly set up your conversions and named them accordingly by reviewing our helpful guide. You can organize your view by clicking on the Columns button above the graph. Keep in mind that this will be your default view on your next login. Once organized, you can monitor your conversions by different data breakouts, using the selections from the top menu. Adding in filters will narrow your data and hone in on the metrics you care about most. Click on the Filter button to the left of Export. Then, add any relevant values in the Filters toolbar. To save for later analysis, click on the “Export” button. In this scenario, the conversion would be attributed to March 1. 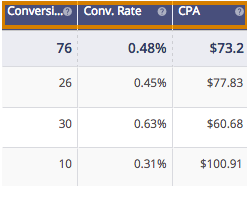 However, if you would like to change this attribution model to count conversions when the reader actually purchases, you can do so by customizing your conversion columns. Click the “Columns” button in the dashboard, then select “Conversions” to expand the menu. There, you can select the attribution model for your conversions. Still not seeing conversions on your dashboard? Contact our lovely Support team for more information.